Last year I posted about my six day business trip to Anaheim. This year I went on the same trip, but one day shorter. 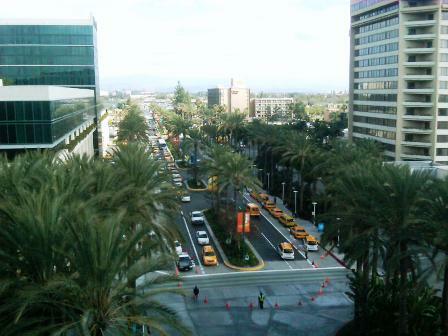 It was the NAMM 2012 show in Anaheim, CA. This a huge and extremely busy trade show, that is not exactly conducive to IBD or SCD. However last year went fine, and thankfully this year did too. Unlike last year I did not have a fridge in my hotel room. I also was not a driver on one of our rental cars so I couldn’t drive myself to the grocery store. Last year I went out and bought myself some salad mix, cheese, and beverages that I could keep in my hotel refrigerator. I had brought along plenty of tuna and Lara Bars, so I would always have something I could throw together for dinner. This year I brought along my tuna and Lara Bars, but I only ended up having the tuna once, since I didn’t have salad to go with it. Luckily there was a restaurant in this hotel that had enough SCD friendly stuff to choose from, and they were perfectly happy to make substitutions. The only thing they didn’t have was plain oil and vinegar, so I had to eat my salad with no dressing. I had planned to blog about the trip as I went along, but the WiFi connection in the hotel was always so jammed up I could never log on. I was not able to 100% SCD without going hungry. I did have some cold cuts, that likely had some illegal ingredients. I have done this in the past when there wasn’t anything else I could have, so I felt okay doing it. For breakfast everyday I had a Lara Bar and a banana, with another piece of fruit at some point for a snack. For lunch I removed the sandwich in the box lunch we had everyday. I also had an apple or pear with it. The sandwich was either turkey, cheese. lettuce, cucumber, and tomato or roast beef and ham with lettuce, roasted peppers, and tomato. Luckily they didn’t put any mayo or other sauces on. Night one: Cobb salad with no dressing. Night two: I made do with my tuna, Lara bar, a banana, and some raw almonds – wasn’t that hungry that night. Night three: New York strip steak plain, with plain roasted vegetables, and fruit substituted for mashed potatoes. Night four: Cobb salad with no dressing. Night five: Hamburger with cheese, crispy bacon, lettuce and tomato, with a side of fruit. I just took the bun off and asked them to leave the condiments off. So it wasn’t 100% SCD, but I did pretty well considering I couldn’t really stock up on anything or prepare any of my own food. I felt fine the whole time and still do, so it all worked out. I love to go for conventions for a trip. I find the bustling activity quite energizing.